Who is Frederick Fennell? Besides being the conductor for the top wind bands like Tokyo Kosei Wind Orchestra (Japan) and Eastman Wind Ensemble, Dr Fennell was also one of the most recorded American conductor with over 300 recorded compositions. Coming 29 Aug, Windstars Ensemble will be performing a concert with Prof. Toru Miura at newly renovated Victoria Concert Hall. Prof. Miura was Dr Fennell’s assistant when he was in Japan and will share with the audience more about Dr Fennell at this concert that celebrates the life and works of Dr Fennell. 2014 is Dr Fennell’s 100th birth anniversary! Toru Miura is currently the Professor of Euphonium & Director of Wind Orchestras at the Kunitachi College of Music, Tokyo, Japan. He is also serving as one of the board of directors of Japanese Band Directors Association (JBA) and Chief, International Relations. Toru Miura has had an absolutely astounding musical career. He is the leading force in the development of euphonium performance and pedagogy in Japan. 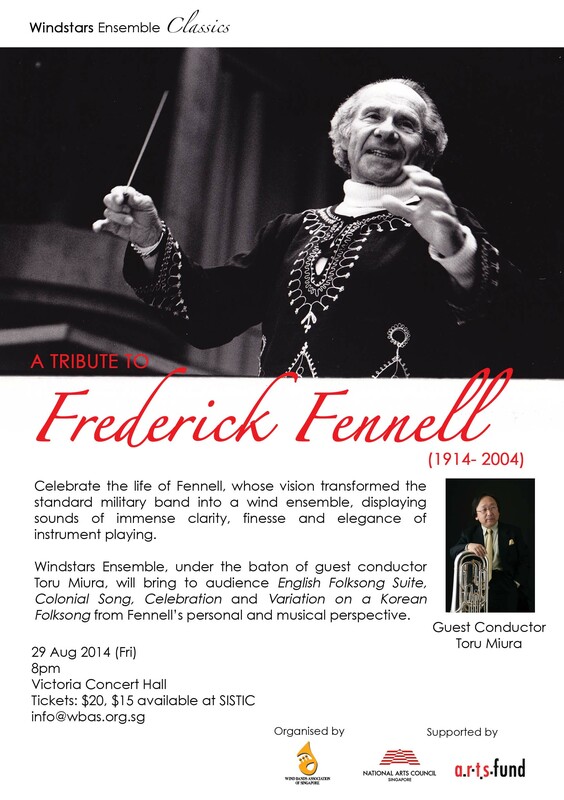 Performing under some of the greatest conductors, such as Maestro Frederick Fennell, he has practically witnessed first hand the evolvement of the professional wind band into the 21st century. Toru Miura earned a B.M. degree with the Ataka Award from the Tokyo National University of Fine Arts, Conservatory of Music. Going to the United States, he received an M.M. degree from the University of Southern Mississippi and from 1973 to 1974, studied at the Eastman School of Music performing in the Eastman Wind Ensemble, conducted by Donald Hunsberger. Returning to Japan, Toru Miura became the principal and solo euphonium with the Tokyo Kosei Wind Orchestra (1978-2007). He has taught at many Colleges and Universities, especially the Kunitachi College of Music. His students occupy prominent positions in Japanese Colleges, Universities and professional performing organizations. Mr. Miura founded the Tokyo Bari-Tuba Ensemble and The Euphonium Company. As a euphonium soloist, he has presented performances at six International Tuba Euphonium Conferences and two International Brass Congresses. He received the Lifetime Achievement Award from International Tuba Euphonium Association (ITEA). In 2011, he brought 79-member KCM Wind Orchestra to the United States and had an exchange with the Eastman Wind Ensemble. Additionally, he made two important appearances at the 65th MidWest Band Clinic performing at the final concert demonstrating their excellence in music education and music styles.